If you’re looking for a fun filled beginners cookery class then look no further. Jamie Oliver’s Recipease is a great way to learn about flavour combinations, pick up a few new skills and enjoy tasty food with friends. 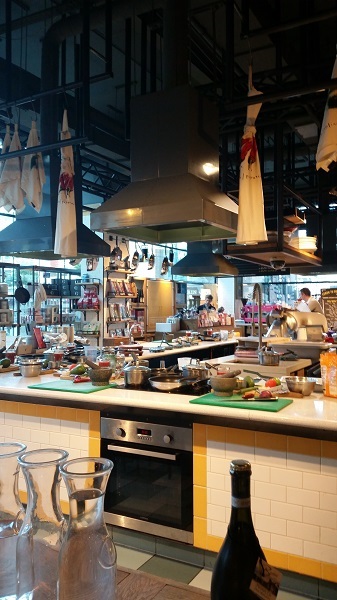 When a friend introduced me to the Jamie Oliver Recipease Cookery School I knew I had to give it a try. I’m a big fan of how simple Jamie’s cooking is so I thought I might pick up a few ideas I could use for my mid-week meals. So, I booked myself on to the Mexican Street Food Class and off I went. There used to be more than one Recipease cookery school (I think I’m right in saying there was a branch in Clapham until quite recently). 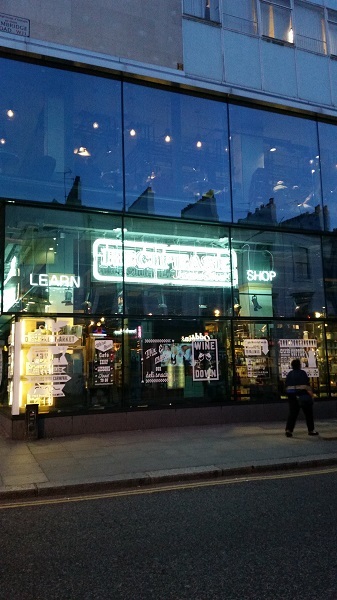 For reasons unknown, all of the branches bar one have closed so all classes are now given out of Recipease Notting Hill. The cookery school is incredibly easy to find, its on the main road and just seconds away from the tube station which is handy if (like me) you are running late from work and are paranoid about getting lost once you’ve got off of the tube! While the fact that it is on a main road may seem like a selling point, when you find out that the cookery school is in fact bang smack in the middle of the Recipease shop / deli suddenly it doesn’t become so ideal. Recipease gets a huge amount of footfall, even at 7pm on a Friday so while you’re trying to listen to chef explaining what you’re going to do in the class that evening you have tourists leaning over your shoulder, taking photos and picking up ingredients…a bit weird if I’m honest. Perhaps its not a fault of location but more a fault of putting a cookery school inn the middle of a shop. Time to expand your unit maybe Jamie? Once I’d gotten over the fact that we were going to be on show for the whole evening I tried to relax – the complimentary prosecco on arrival certainly helped with that. But I soon realised I was going to be the odd one out… everyone else had come to the class in pairs or in a group. A friendly couple got chatting to me and asked if I’d ever been to a Recipease lesson before. They could see from a mile off I hadn’t and they kindly informed me that all recipes are cooked in pairs. I was going to have to team up with someone else as I wouldn’t be cooking all of the dishes myself. The class I was attending was the Mexican Street food Class. It started with chef getting us to gather round the kitchen area and talking us through how the class would work. We’d cook in pairs (check), all of the ingredients had been pre-weighed for us and were out on our work stations. Chef would show us what to do and then we’d go away and do the cooking. Seemed simple enough. Without hesitation, and with us still standing around, chef began to talk through the first half of the recipes. 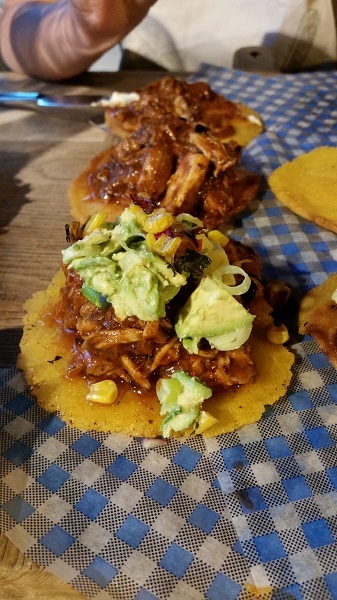 We started off with an explanation of the smoked chipotle chicken and spicy roasted corn salsa. A quick demonstration from chef and we were out our work stations giving it a go ourself. Considering absolutely everything had already been weighed out I didn’t actually have to do anything in the first part of the lesson. My new “friend” was in charge of chopping the onion, spices and herbs. I was in charge of putting stuff in the pan and making sure it didn’t burn, as well as prepping the soft corn tortillas. Can we call this cooking?! With that done, we went back to chef’s station, gathered round and were shown the next set of recipes: sautéed spinach with herbs and feta cheese, smashed guacamole and a chunky tomato salsa. Again, there was minimal actual cooking here. I chopped up the avocado for the guac but beyond that it was really a case of assembling the pre-prepared ingredients. By this point, a couple of glasses of wine had been consumed and with no written recipes to follow people were getting confused about which ingredients went into which dishes. The recipes were so simple however that it really didn’t matter. I think the onion, coriander and chilli literally went in everything! After scoffing more than half of what my new friend and I had cooked (win!) I made the most of the 10% discount given to class attendees in the deli. With my full tummy and heavy shopping bags I stumbled back on to the tube and headed home. An evening well spent? While I did enjoy myself and the food was delicious I was a little frustrated by the class so I want to make one thing clear – these classes are definitely designed for beginners and more of a social evening out than an opportunity to learn new skills. If I’m perfectly honest, beyond making corn tortillas for the first time I actually learnt nothing. I was also a little disappointed as we weren’t given the recipes to take away (we could buy Jamie’s cook books in the shop but the 10% didn’t apply to them…) – the recipes did however materialise almost three weeks later. Despite all of this I did have good fun. To make things easier I’ve written a pro’s and con’s list based on my experience. Would I go back? Possibly! I think it would be a laugh going to a pizza making class with friends. It’s certainly an alternative night out! 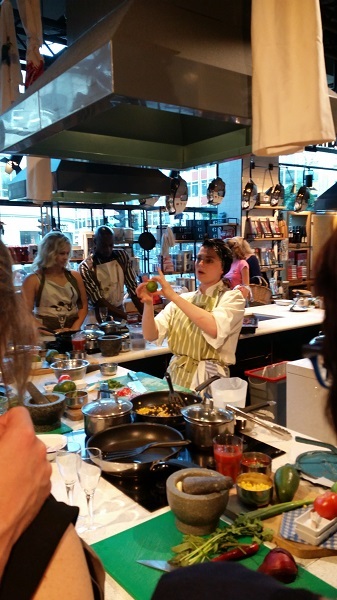 Have you ever attended a Recipease class? Either in Notting Hill or Clapham? What did you think of the class. Doesn’t sound wonderful – especially the bit about not being warned to go in a pair – that’s really quite poor. A pasta making course – raviloili perhaps? -would be good I expect – there’s a real art and skill to that! I booked through Time Out which meant it was incredibly cheap (just £20) and I did have fun despite the various hiccups. Usually I think the cost is more like £45 so not sure I would consider it great value for money if I had paid full price. Hard to know! I often pop in there just to have a look, buy some bread or a jar of something. Sounds like the class was more suitable for a fun night out with friends or workmates, not so much a serious cookery class though. I think in the majority of the cooking classes that I’ve attended you work as a pair so that wouldn’t have come as a surprise to me. Disappointing not to get the recipes emailed to you sooner but the food you made looks great. 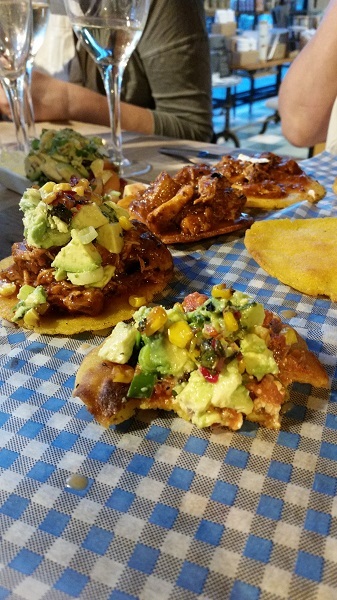 I love cookery classes as well – thanks for the honest review, I don’t think this one sounds amazing, although it’s good that you enjoyed the food. Jamie is great for simple but tasty recipes, but it sounds like you can probably learn as much from his books.